Crew: 1,014 (counting civilians), 15,000 person evacuation limit. Standard Duranium/Tritanium Double hull plus 9 cm High density armour. Notes: The Galaxy class was developed to replace the ageing Ambassador and Oberth class starships as Starfleets primary exploration vessel. The design was initiated in 2343 with a highly challenging specification which called for a ship based on the Nebula design then being developed, but equally capable of scientific, exploration, diplomatic, cultural, and combat roles all within a single multi-mission hull. In fact, many came to regard the requirement as too challenging; the project suffered from numerous delays due to a wide range of design, manufacturing, and construction problems. The first of the class, the USS Galaxy, was launched in 2357 and commissioned in 2362, nearly two decades after initial approval. The Galaxy class which emerged from the Utopia Planitia shipyard had very similar lines to the Nebula class. The Galaxy is slightly larger in volume, although its less compact design gives it considerably greater length than the smaller vessel. The major change between the two is the lack of a mission specific pod on the Galaxy class, the increased volume allowing sections within the hull to be mission customized. This combined with a more advanced systems level to allow all functions to be performed by the single design. In addition the saucer and engineering hulls are separated by an eleven deck connecting neck section. This separation between the two hulls allows the nacelles to be located outboard and above the engineering hull, a position which increases the efficiency of the warp drive field slightly. This gives the Galaxy class warp coils an efficiency of 88% at speeds of up to Warp 7 and 52% through Warp 9.120 - the comparable figures for the Nebula class are 84% and 47% respectively. In 2370 first contact was made with a race known as the Dominion. The initial contact with them saw Commander Sisko get taken captive and the Galaxy class vessel Odyssey get destroyed. With the USS Excelsior-A heavily damaged from a run in the badlands starfleet decided to overhaul the Galaxy class upgrading the weapons, speed and shields even though that would limit the science capabilities slightly. The USS Excelsior-A was the first to be launched in 2372 as a galaxy 2 class ship with enhancements to weapons, shields and speed. To compensate for the additions the galaxy 2 class has significantly fewer science labs than the original galaxy class. Most of the labs have been converted to storage areas for extra torpedoes and other miscellanous equipment needed. With the Galaxy two being pushed to the front lines some of the labs on deck twelve had the walls removed and were converted into a larger brig. Cargo bay three has been upgraded to serve as an emergency sickbay and equipped with holoemitters so the EMH can be projected there. The increased internal volume allowed for 800,000 square metres of mission adaptable facilities. This allows the Galaxy class to support a wide range of ongoing research projects independently of the vessels primary mission. 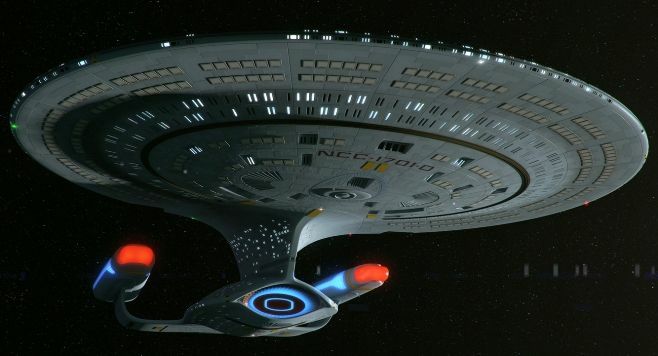 Although not a new idea in Starfleet vessels, the Galaxy class is unique in the extent to which this is possible. These ships are capable of supporting up to 5,000 mission specialists, while the decentralized nature of the secondary power grids allows laboratories to function effectively even during combat operations. The combat capability of the Galaxy class was also significantly greater than that of the Nebulas. The burst fire torpedo tubes are each capable of launching groups of photons torpedoes, up to ten at a time every six seconds. As with many recent Federation designs, the use of long phaser arrays rather than banks gives the main phasers of the Galaxy class a great capability for sustained firing and rapid recharge/cool down time. The Galaxy class is the first on which all segments of every phaser array are supplied by a separate power system; although this increases the complexity of the system tremendously, it gives the phaser arrays a tremendous survivability in the face of combat damage. In service the Galaxy class at first proved exemplary, beyond any of Starfleet's expectations but by 2371 no less than two of the initial six ships had been lost - the Yamato and Odyssey. Yamato 's loss was particularly horrific, as she was destroyed with her entire complement of crew and families aboard. This alarming record led to many changes being introduced during refits of the remaining three vessels, and also to the construction of six new Galaxy class ships from space frames held in reserve against future need. The unfortunate history of the Galaxy class vessels combined with the recent escalation's in tensions within the alpha quadrant has led to all six vessels being subsequently completed, and all are now on active service against the Dominion. Major changes to the Galaxy class have included a new warp core, a redesigned shield system intended to perform far better against phased polaron beam weapons, various changes to the ships computer systems, plus many minor changes to the ships systems. 1 Main bridge, main observation lounge, captain's ready room. 24 Main impulse engine, photon torpedo magazine, crew lounges nacelle - Control room upper level (P/S).